Q. How can I bring a Moroccan feel into my garden? THE TRADITIONAL MOROCCAN garden is usually a small open courtyard encircled by the house. 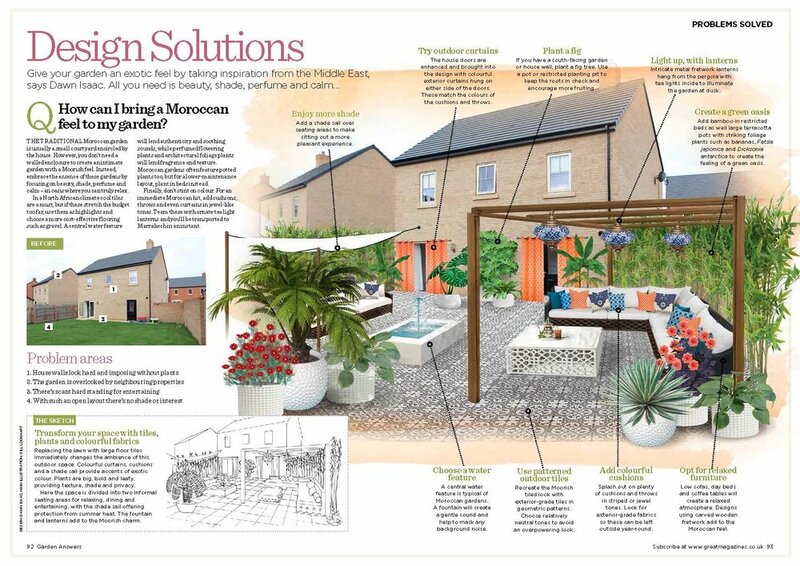 However, you don’t need to follow this model to create an intimate garden with a Moroccan feel. Instead, embrace the essence of these gardens by focusing on beauty, shade, perfume and calm – an oasis in which you can truly relax. In a North African climate, cool tiles are a must but if these stretch the budget you can use them as highlights and choose a more cost-effective main flooring such as stone chippings. A central water feature lends authenticity and soothing sound effects, as do plenty of architectural foliage plants. Moroccan gardens often feature potted plants but for a lower-maintenance layout you could plant in beds instead. Make sure you add some perfumed species, such as highly fragrant roses. Finally, don’t stint on colour. For an immediate Moroccan hit, add cushions, throws and even curtains in jewel-like tones. Team these with ornate lanterns peppered with tea lights and you will be transported to Marrakech in an instant. Recreate the Moorish tiled look with exterior-grade tiles in geometric patterns. Choose relatively neutral tones to avoid an overpowering look. A central water feature is typical of Moroccan gardens. Add a fountain to create a gentle sound and mask background noise. Add bamboo in restricted beds as well large terracotta pots with striking foliage plants such as bananas, Fatsia japonica and Dicksonia antarctica to create the feeling of a green oasis. Add a shade sail over seating areas to make sitting out a more pleasant experience. If you have a south-facing garden or house wall, plant a fig tree. Use a pot or restricted planting pit to keep the roots in check and encourage more fruiting. Add plenty of cushions and throws in striped or jewel tones. Look for exterior-grade fabrics so these can be left outside year-round. Use low sofas, day beds and coffee tables to create a relaxed atmosphere. Carved wooden versions add a suitably Moroccan feel. Intricate metal fretwork lanterns hang from the pergola with tea lights inside to illuminate the garden at dusk. The house doors are enhanced and brought into the design with colourful exterior curtains hung on etier side of the doors. These match the colours of the cushions and throws.